Accessories are a great way to dress up an outfit. You can wear something plain and boring, but when you add a fashion statement, like a necklace, it automatically transforms it. 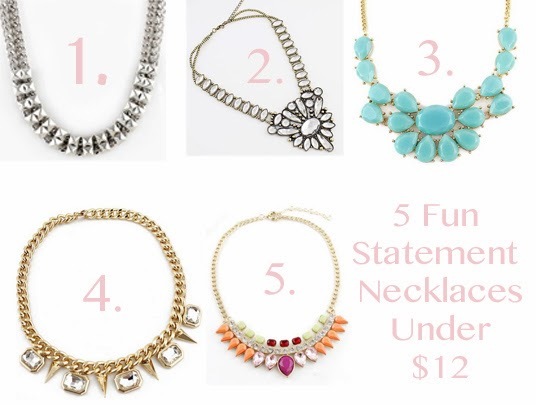 These necklaces are from She Inside, an online store that has accessories and clothing at affordable prices. The best thing is that they offer FREE SHIPPING! Los accesorios son esenciales para cambiar el look de un atuendo. Puedes ponerte algo aburrido, y al agregar un accesorio de moda, como uno de los collares de aqui arriba, automaticamente transformas tu atuendo. Estos collares son de She Inside, una tienda en linea que vende accesrios y ropa a un buen precio. Y lo mejor de todo, envían a Mexico y varios paises GRATIS!